Art Therapy is a form of psychotherapy that uses art media such as plastic arts, music, dance, theatre, writing, etc. - as its primary mode of communication. Our workshops focus on painting and writing by means of musical induction. Other artistic mediations can also be offered during the progression of the therapeutic process. Should one be artistically talented to participate in our workshops? No, absolutely not! Your resources will even surprise you! Your work is not an end in itself but only a means of facilitating communication with yourself and with others. Your work, which becomes the support for interpretations of other companions present in the workshop, will also contribute to their transformation. As your artwork allows you to talk about yourself without saying "I", the wounds of the past can be addressed non-intrusively. Every Wednesday from 10h to 12h and from 14h to 16h, starting 9 January 2013. Additional sessions can be arranged according to demand. In what language do these workshops take place? 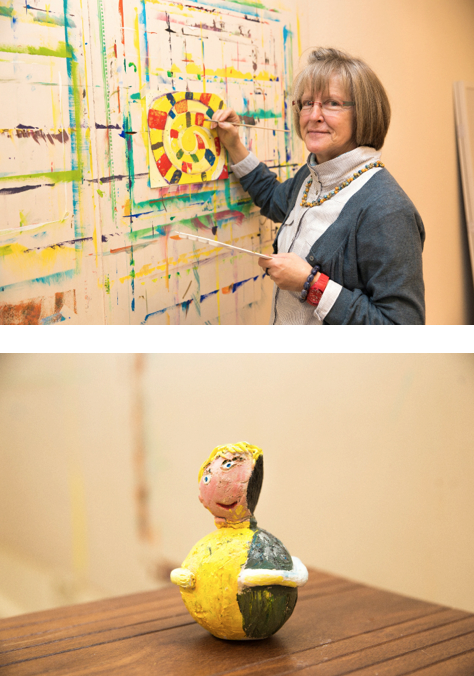 Graduate art therapists who speak French and Luxembourgish teach these workshops. Workshops in English can also be arranged according to demand. All workshops are free! Come and join us! In the Fondation Cancer’s premises, where we have especially arranged a warm space dedicated to your comfort. 209, route d' Arlon, L- 1150 Luxembourg. Dans la presse: "Fondation La Violette: Pour l'amour d'une mère"